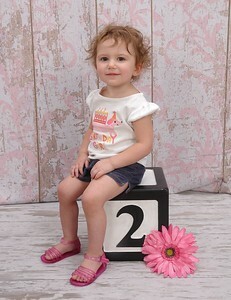 Addison's second birthday has come and gone. 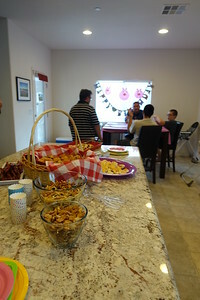 We had a fun-tastic party and we had lots of friends over to help celebrate. Our theme was Disney's Goldie & Bear, which is still in its first season so they have not printed decor, clothes or made toys. I couldn't find a single thing - not even in Anaheim. 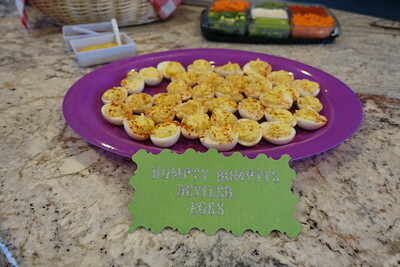 So, pulling the theme together took a little creativity, but Amy and I had fun coming up with ideas. Addy just loves (Jack) Bear. She asks daily to watch and I know the episodes like the back of my hand. 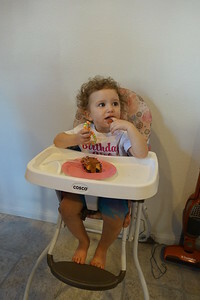 She also likes the three little pigs, big bad and the frog. The "Cow Jump" episode is a favorite. 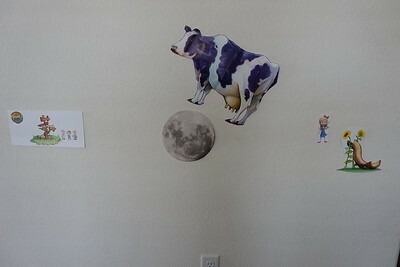 We had pin the tail on the cow that jumps over the moon. 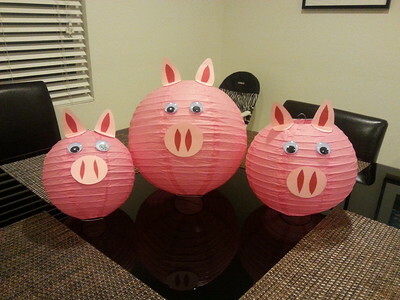 I made pigs out of paper laterns. 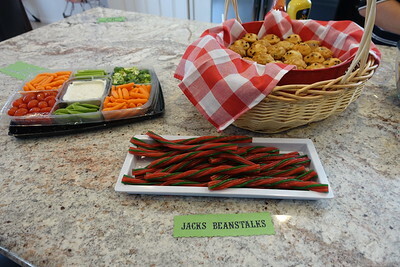 Our snacks all fit the fairytale theme: humpty-dumpty's deviled eggs, three little pigs in a blanket, little red riding hood muffins, Jack's beanstalks, and snack mix with bricks (chocolate chunks), straw (shoestrings) and sticks (pretzels). We also had bottled water in Jack's pail. 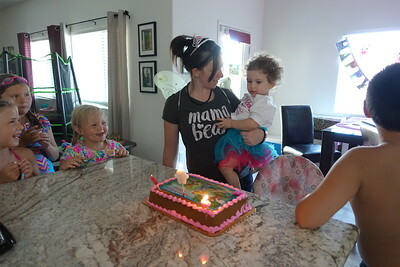 Addy was more interested in her candy necklace than her birthday cake, but Lexi thoroughly enjoyed the sweet taste of frosting - much to mama bear's dismay, but that's what grandpas are for. The kids swam and chased bubbles. 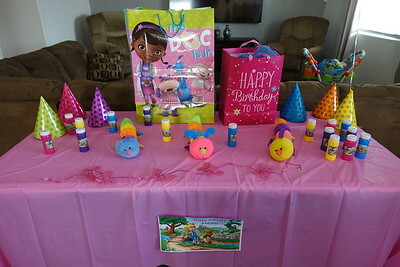 Addy was fortunate to receive many awesome gifts. It was a great day. Let's hope the 2's are anything but terrible. In any case, the next year will certainly be an adventure with this hilarious, too smart for her own good, insanely cute kid. For a while, pizza and burgers were the latest trend. Now poke bowls and sushi burritos seem to be all the rage. New restaurants are sprouting up all over the valley offering these delights. I recently tried the newly opened Pokeman. Located just minutes from the strip in Chinatown, Pokeman shares the same owner as the neighboring late night tapas favorite, Izakaya Go. Only a couple months old it's already established itself as a lunch hot spot. Parking is limited and the lines can be long so keep that in mind if you're short on time. Pokeman offers a menu of several sushi burritos, and custom poke bowls in three sizes: single, double or triple scoops of protein. I'm familiar with sushi burritos so I decided to opt for the bowl to try something new. I admit I was a little nervous about choosing a bad combination, but I went with what sounded good at the time... I was pretty hungry so I chose the medium bowl ($10.95) with yellowtail and spicy tuna. You also have your choice of white, brown or sushi rice. I had the latter, then selected lettuce, cabbage, cucumbers, salsa, cilantro, and scallions. 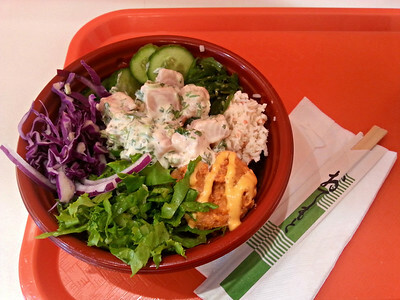 Plus, the bowls include surimi crab and seaweed salad. I also had the spicy mayo drizzled over the tuna and the yuzu aoli on the yellowtail. When I dug in, I was pleasantly surprised how well the bowl melded together. 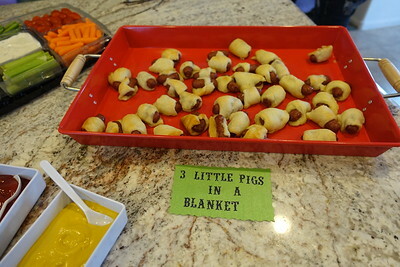 It had bold flavors, different textures and it was extremely fresh. I get into lunch ruts regularly so I'm thrilled to have a new option nearby. And with endless combinations, it will take forever to "catch 'em all." Frank and I snuck off for a quick trip to So Cal. 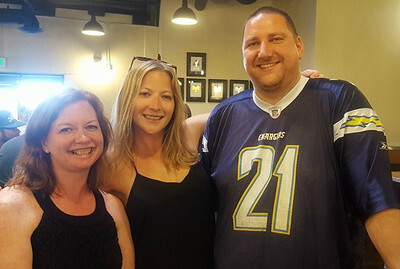 Stopping in LA for pastrami at Langers, taking in a ballgame in Anaheim - Go White Sox!, brewery hopping with an old friend from jr/high school, and running off to San Diego for tasty eats at Con Pane Bakery and El Indio, and ocean breezes in La Jolla. It's stuff that's just good for the soul. 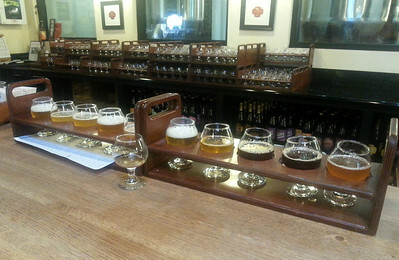 In Anaheim, we visited The Bruery, Bruery Terreux and Noble Ale Works. All great finds, but my favorite was Noble Ale Works. 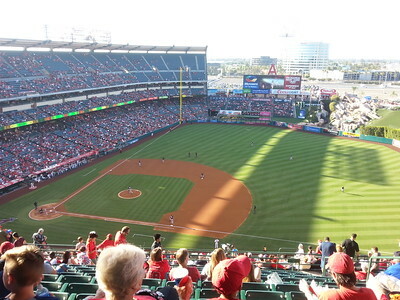 Not only is it walking distance from Angel Stadium, but it also has amazing beers! Nosecandy had all the flavor of a full bodied IPA, but lacked the punch. The ABV of only 4.4% made for some easy drinking. Man's Milk was an outstanding milk stout - creamy, roasted coffee and rich dark chocolate flavor with only a scant of sweetness. The perfect dessert (at least in my book) might just be the Naughty Sauce. Also a milk stout, though, more golden in color, rich roast flavor, but with vanilla, reminds me of chocolate chip cookies. This will be a must stop whenever we catch a game!! 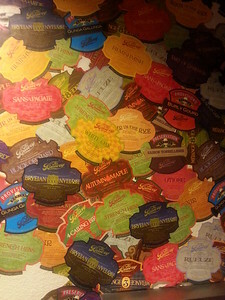 We sampled quite a bit from the Bruery. My favorite was a sour exclusive to Society members, Sour in the Rye 2016 - we were fortunate to get a sample. It was fantastic. I only wish we could've brought a growler home. They recently opened a second tasting room called Terreux. 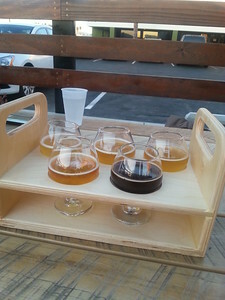 It has a great patio and a nice selection of sours. 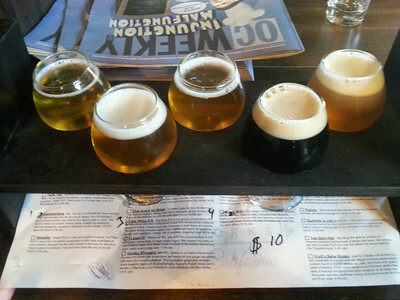 However, none were as good as that members only selection over at the Bruery. Angel games are always fun, but we had an added bonus of friends from Vegas join us - both couples are originally from Chicago too. Plus, this night had fireworks after the game. It was a nice display and it softened the blow of our loss. 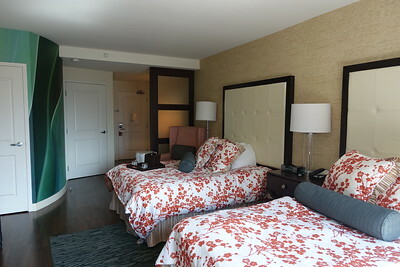 We had a nice stay at the Holiday Inn Anaheim. Better than expected considering its aimed at families visiting Disneyland. We met our friends for breakfast at Anepalcos. 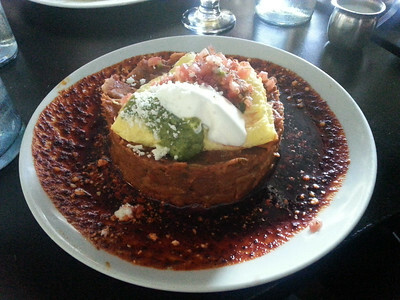 It comes highly recommended and they're known for chilaquiles, so I was mighty excited. They looked beautiful, but the sauce was more acidic than anything and as a whole the experience was rather disappointing. Bummer. Rather than stay in Anaheim, we made a last minute decision to head to San Diego for the night. 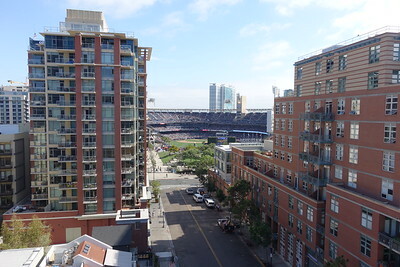 I was able to secure a surprisingly good last-minute deal on Hotwire at the Hotel Indigo which is right in the heart of the Gaslamp, only a stone's throw from Petco Park. The hotel was great, only complaint was that parking was pretty pricey, but that's typical downtown. The rooms were without carpet and I was in love. 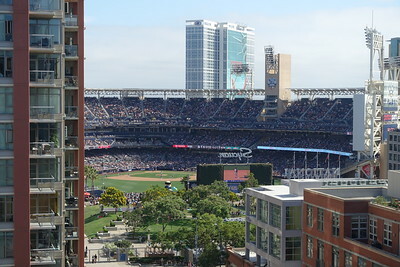 There was a rooftop lounge with a nice view of the ballpark. We hung out there for the final innings of the game. In addition to eating at our favorite places, we also returned to the Cuban Cigar Factory which has undergone a renovation since our last visit. It's a bit more comfortable now, it's a great place to enjoy a stick and try a variety of local beers. 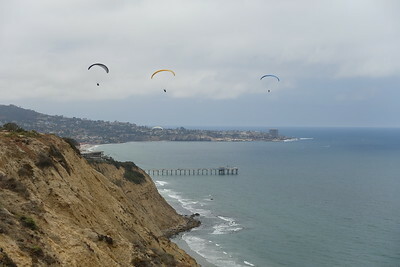 No trip to San Diego is complete without a stop in La Jolla. There are few places better than being perched on the cliffs above the Pacific. It is definitely our happy place. It's been fairly quiet around these parts. Not a whole lot has been going on, but time flies nonetheless. 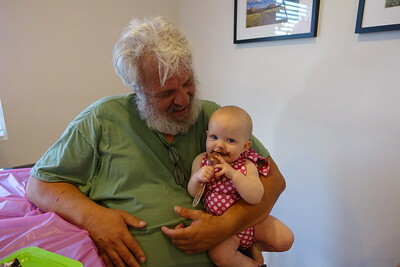 My dad came to visit for 6 weeks. He was laid off from his job after nearly 40 years of service. It seems so wrong, but I suppose that's become the norm these days. There is no benefit to loyalty and long-term employment. I'm not sure what's next for my dad, but it was good to spend time with him. It would've been nice if could have stayed a little longer since he'll be celebrating his 60th birthday tomorrow. Though, we did get the family together for dinner at Texas de Brazil before he left. 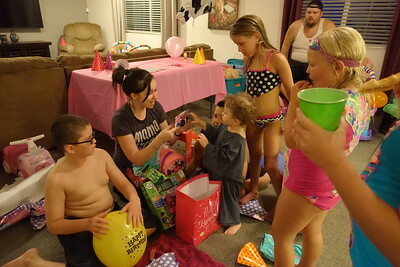 Not only were we celebrating his birthday, but my brother and sister's too. Mike's birthday was last month and Amy shares a birthday with my dad. We stuffed ourselves silly. The leg of lamb and beef rib were outstanding. 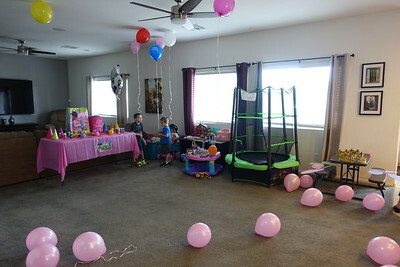 Speaking of birthdays, Amy and I have been in planning mode since Addison will be two on the 16th. 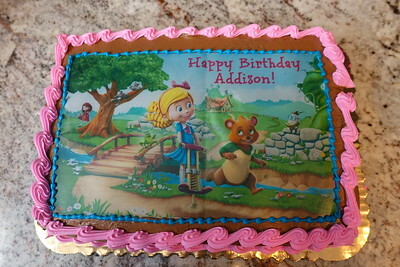 We are throwing a Goldie and Bear party on Sunday. The party should be a riot. She shows such excitement over the simplest things, she's is going to lose her mind. Just shopping at the party store was non-stop thrills. It will be a joy filled day for sure. Nick just finished the 3rd grade. 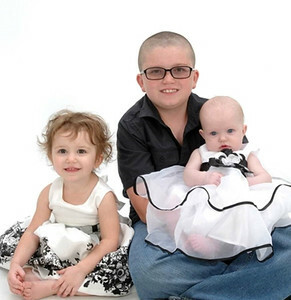 Since his school was year around, but is now switching to 9-month school he won't have much of a summer break, but he'll surely fill his time with Xbox games, Pokemon Go and You Tube videos over the next couple weeks. Lexi has turned six months, which is complete craziness. Our newborn days are over, but it's such fun watching her grow. She's beginning to sit up, she has a death grip and swats everything in sight, she blows raspberries and has an infectious laugh. Let me tell you a story about a tree. When we moved into our house last year we knew we'd be removing the grass and adding the fire pit. There was a plum tree at the edge of the yard, that my mom called dibs on before our boxes were even unpacked. When we stopped watering the grass, it became obvious that the tree was benefiting from the sprinklers and it did not have a bubbler of its own. It began to wilt, which irked my mom to no end. She told me she'd dig it out herself, if breathing wasn't such a struggle for her - I'm sure she would have. She was pretty adamant that the tree lived. It mattered little to me, so the only time it would get water was when it rained. Fall came, and winter followed. Having lost mom in September, I hadn't given the tree much thought. I assumed it was dead. But then in spring, it developed buds and grew. Maybe mom had something to do with it? 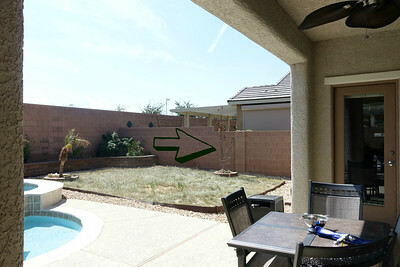 But more likely, the neighbors watering their yard on the other side of the wall allowed it to flourish. 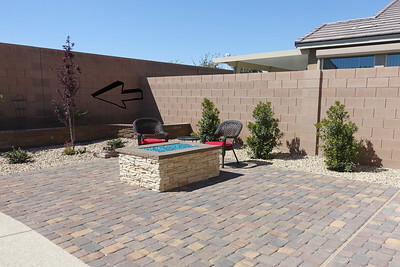 When we were getting quotes for the landscaping we had no intention of keeping the plum tree. It didn't really fit into our design ideas, and we really wanted clean, low maintenance plants. However, when the time came Showready suggested that they could transplant it and incorporate it into our design and it'd save some money since it'd be one less plant to purchase. Plus, I knew how happy my mom would be. So, the choice was easy. The plum tree was relocated and it handled the move A-OK.
A few months went by, and one night, Frank and Jeff were in the backyard. They noticed something furry in the branches. As they approached the tree they were able to see it was a hummingbird. 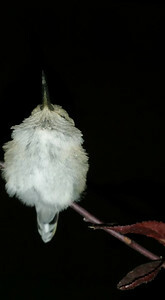 Never before had I see a hummingbird sleep. My mom and grandma had hummingbird feeders since I was wee, but never, not once, do I recall seeing one sleep. I had no idea that they enter a hibernation state called torpor. 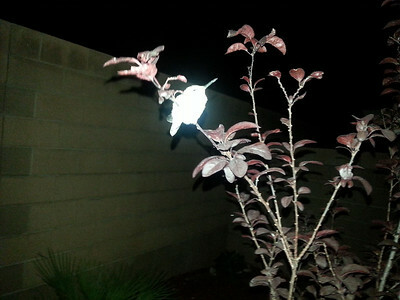 This ensures that the birds don't starve to death before morning. 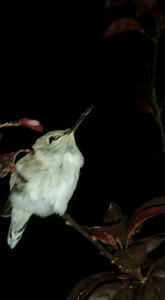 It was pretty wild, but it seemed rather appropriate that the hummingbird took comfort in mom's tree.